India is one of the fastest growing car markets in the world. In 2010, Mahindra Logan saw a 60.3%1 drop in sales compared to the previous year. This article explores the reasons behind this decline by studying the perception of the consumers about Mahindra Logan. The various segments of consumers and what they look for in a car are also studied. The future course of action for Mahindra Logan and some key recommendations follow from this study. Indian is one of the fastest growing car markets in the world. According to SIAM (Society of Indian Automobile Manufacturers), the Indian passenger car market is expected to grow from the current 2.5 million to 4 million units by 20152,3 . The market had a compounded annual growth rate (CAGR) of 24.3% for the period spanning 2005-09 and industry forecasts estimate the passenger car market to grow at 20.1% by 2014. The major players in Indian passenger car market are Maruti-Suzuki, Hyundai, Tata Motors, Honda, Toyota and Mahindra & Mahindra. Mahindra & Mahindra Automotive Division is the flagship company of the Mahindra conglomerate. Founded in 1945, the company has emerged as a leading player in the farm equipment, commercial vehicles and utility vehicles segment, with its portfolio comprising a wide spectrum of products including two wheelers, light and heavy trucks, SUVs and school buses. Mahindra & Mahindra is also one of the leading tractor brands by volume and is the largest manufacturer of tractors in India. Looking to foray into the lucrative passenger car market, Mahindra & Mahindra entered into a joint venture with Renault S.A in 2005. Their first product, Mahindra-Renault Logan was launched in 2007 as an entry level sedan. It was derived from Dacia Logan, a small car manufactured jointly by Dacia Motors and Renault. At the time of launch, Logan received generally favourable reviews, getting credit for its practical design and competitive pricing. However, consumer confidence in brand �Logan� began to decline soon. The situation was further exacerbated when Renault entered into talks with Nissan for launching passenger cars in India. Prospective consumers were concerned if the company planned to be around for the long haul. By March 2010, annual sales were down to 5332, a decline of over 60% from 2009, at a time when the overall A3 segment (discussed later in Exhibit 1) in India registered a growth of 14.2%. Despite a booming economy and strong consumer outlook, Mahindra Logan failed to leverage thisopportunity to gain a foothold in the A3 segment. In order to analyse the factors responsible for failure of Mahindra Logan, we have used market research techniques to gain insights into its positioning and customer perception. What are the important attributes that customers take into account when buying a car in A3 segment? What is the current brand perception of Mahindra Logan with respect to the different attributes considered important for A3 segment? What is Mahindra Logan�s positioning vis-�-vis its competitors along various dimensions? What are the demographic and psychographic profiles of potential customers of Mahindra Logan? It can be observed that the above listed questions aim to identify key dimensions along which cars in A3 segment can be positioned. The following sections answer each of the above questions and provide appropriate analyses which lead to our conclusions and recommendations. To attract a particular customer segment, each product or brand has to create its own unique image which is more attractive to the targeted customer segment compared to competing brands. The process through which this is done is known as brand positioning. Often this is done by developing a particular set of product features aimed at a customer segment and running a targeted advertising campaign to communicate the same. The primary objective is to cut through ambiguous and often generic communications clutter to reach out to the intended customers. Generally, there are 3 major aspects of brand positioning - Functional, Symbolic and Experiential; an effective positioning process should place enough importance on all of them, though mostly one of the aspects becomes more important compared to others depending on the product type and competitive dynamics. It can be argued that in the Indian car market most of the passenger cars competing in a segment have more or less similar features with marginal differences depending on the target segment. Hence, symbolic and experiential aspects become very important in terms of positioning. Automobiles can be classified based on different criteria. Society of Indian Automobile Manufacturers (SIAM) classifies automobiles based on their length. As per this model, cars are classified into different segments such as A1, A2 etc. The complete list of passenger car segments is given in Exhibit 1. Based on this classification, Mahindra Logan is classified in A3 segment, i.e. a midsize car. Competing cars in this segment include Maruti Suzuki SX4, Maruti Suzuki Dzire, Hyundai Verna and Tata Indigo. We can also classify Indian passenger cars into different segments based on price and functionality. Using this model, the most commonly used classification is listed in Exhibit 2. Logan can be classified under the premium segment as its price ranges from approximately INR 5 lakhs upto INR 7.5 lakhs. Priced at the lower end of the premium segment, it targets customers who plan to upgrade from a small car to entry level premium segment. It is also a preferred choice for corporate and car rental agencies. Later, the company went in for a repositioning strategy by turning to emotion driven advertising by highlighting the value-for-money, mileage, ride quality and trouble-free ownership. Data from research reports however indicates mixed signals. While Mahindra & Mahindra has positive connotations of being tough, reliable, rugged and economical vehicles, the company�s products are not perceived as modern or technologically advanced. Another reason frequently cited is Logan�s dated and boxy looks. It faced a further dent in its image when it ended up being widely used as a preferred vehicle by taxi operators. Using market research techniques, we identified the significant factors that customers take into account while making purchase decisions for cars in A3 segment. These are listed in Exhibit 3. The snake-chart in Exhibit 4 identifies the relative perception of Mahindra Logan and competing cars along significant factors in A3 segment. It is interesting to note that Mahindra Logan is rated poorly by customers along most dimensions, except spaciousness. The importance of correct brand positioning is brought out all too clearly in Mahindra Logan�s instance. What is even more surprising is that even though Mahindra Logan highlights price and mileage, it has been rated poorly in these aspects too. This is clearly due to its ambiguous positioning. Mahindra Logan is an average performer on price and mileage aspects with serious issues on interiors and style dimensions. This is reflected in customers� poor perception of the car along most dimensions. Cluster analysis refers to the process of assigning a set of objects into distinct groups, so that there is a higher similarity among objects within a group, as compared to across groups. Using cluster analysis, we have identified 3 key customer segments that exist in the A3 category.The first segment includes customers who value luxury and style in their cars. The common factor that connects customers within this group is higher income level. The second segmentvalues economy and efficiency in their vehicles. They also need to make family trips and highly value extra space. The third segmentcomprises of single individuals withhigh income. They prefer high-performance cars with powerful engines. From the cluster analysis, it becomes very clear that Logan can and should target only the second segment of customers. Different customers have different expectations from their cars. In some segments, some characteristics will be far more important than others. We conducted a test called Ideal Point Modelling on Mahindra Logan and other cars in the A3 segment. Ideal Point Modelling assumes that more is not always better. There is an ideal amount of a certain characteristic that is required to satisfy customers. For factors like space, styling etc., there will be an ideal point at which customers will be satisfied and hence, satisfaction will not improve further if these characteristics are increased. The customer wants a minimum threshold for each feature above which the feature becomes less important than others. Exhibit 5 illustrates the ideal-point modelling of Mahindra Logan vis-�-vis its competitors, along 3 distinct centre points � Space, Style and Mileage. It is clear from ideal point modelling that Maruti Suzuki SX4 and Dzire have succeeded in building a positive brand image for themselves, hovering close to the ideal centre along all 3 dimensions. Even though Mahindra Logan is known for its spaciousness, the company went overboard on this attribute and after a point becomes irrelevant for the consumer and thus it does not score well on the ideal point preference map. 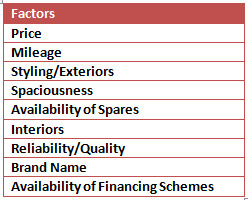 Our analyses indicate that Mahindra Logan does not have a favourable brand image along most of the factors considered important for cars in A3 category. This indicates a strong need for rebranding. Logan needs to reposition itself on almost all its features and even go in for change in product features if it has to hit upon the right customer segment and compete effectively in the A3 segment. As identified from ideal-point modelling, the only point where Logan is perceived favourably i.e. spaciousness has a limited appeal to customers after some level. Ironically, the company has emphasized on spaciousness as one of the main factors. We feel that an appropriate marketing communication mix should reposition Logan as a comfortable, practical and no-nonsense car for families. With a tenuous joint-venture with Renault and Logan sales dropping to approximately 500 per month, Renault announced its exit from the JV with Mahindra buying out Renault�s 49% stake. In April 2011, Mahindra rebadged the car as �Verito�, with minor cosmetic changes4 . The Verito is positioned as the �mature man�s sedan�. The name �Verito� itself has been derived from the Latin word �Veritas� meaning �truth� to complement the overall image of an honest, sensible and dependable car5 . Nagasimha Balakrishna Kanagal is an Associate Professor in the Marketing Area at IIM Bangalore. He holds a Ph D from University of Texas at Dallas, USA. He can be reached at kanagal@iimb.ernet.in. Trideep Basu (PGP 2010-12) holds a B.Tech. in Electronics and Communication Engineering from National Institute of Technology, Durgapur and can be reached at trideepb10@iimb.ernet.in.